The cellphone is an invaluable and inseparable part of our digital lives. That must be why losing access to it — even for an hour or so — can cause widespread public protest and civil disruption. Ontario’s students need to focus on their learning and not their cellphones, the government says, tabling proposals it says will ensure that happens. OK, so there are several education issues more important than the proposed cellphone ban in Ontario classrooms. The thousands of students who walked out of their schools or teachers who protested on the lawn at Queen’s Park recently are more concerned about cuts to the education budget overall (as well as increased class sizes, accommodating students with special needs, curriculum development, the so-called student choice initiative and the firing of thousands of qualified teachers) than about banning cellphones in the classroom. But among the proposals contained in the Ontario government’s new Education that Works for You document, there’s that province-wide call to do just that. Lisa Thompson, Minister of Education, announced the plan and the ban are to take effect next September. There’s long been a debate about the impacts of cellphone use in class, but no single conclusion or outcome has been reached. The argument about cellphones in the classroom can become just as distracting as their possible use there. Are cellphones and other mobile devices useful teaching tools or dangerous distractions in the classroom? They’re both: that’s why other jurisdictions have struggled with the issue. Some choose to overturn existing cellphone bans, some work with a ban similar in construct to the proposed new rules, some never implement a ban in the first place. School boards and educational jurisdictions have struggled with the issue of cellphone use in the classroom. Supplied Dojo image. Toronto’s own school board tried for four years to implement a top-down cellphone ban; doing so was found to be almost impossible to enforce and the TDSB now lets individual teachers decide what is best for their students and classes (awaiting final outcome of the proposed bill). Alberta’s education minister David Eggen said his province is not considering implementing a ban, preferring to let teachers and school boards make their own rules. 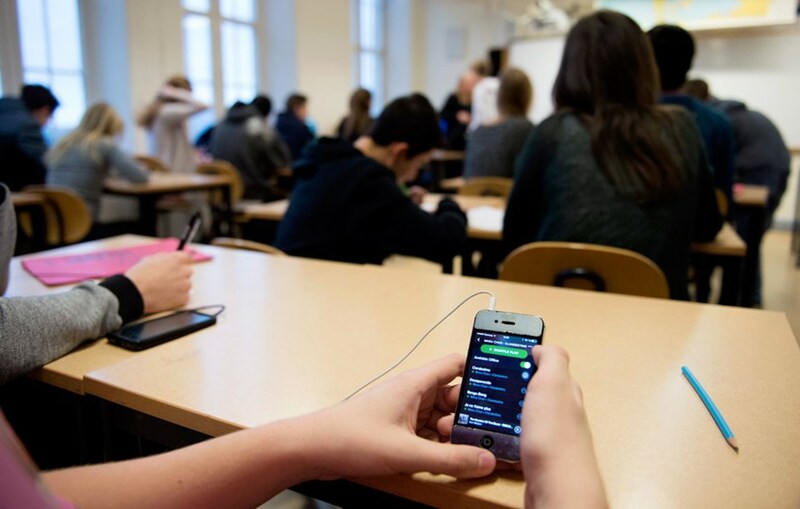 The Alberta Teachers Association conducted a multi-year study into cellphone use in the classroom and technology’s overall impact on student performance. There were several pluses and minuses identified, of course, leading the group to recommend that teachers and students should be informed about the issues and given the opportunity to establish their own classroom culture that uses technology appropriately, if at all. Proponents of digital media literacy training in schools say that rather than banning use, students should be taught how to use mobile phones and other digital devices responsibly, often while introducing other important topics like social media and online privacy. Overall, many teachers incorporate cellphone use in the classroom specifically to enhance learning while others choose not to use them at all. 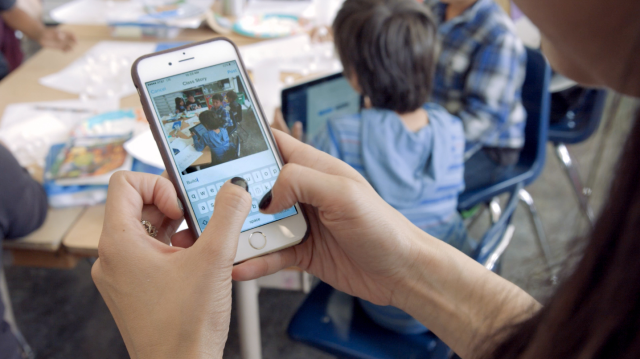 Leaving each individual teacher (with students and parents involved) to decide how they will deal with devices in their classroom is a widely recommended education strategy. The Ontario Public School Boards Association says its members should be allowed to make their own decisions, describing a policy in place before the ban was announced. “Schools and teachers have well-established limits and boundaries with regard to cellphone use in schools and the classroom, similar to other classroom expectations, which are designed to create positive learning environments,” the association said. 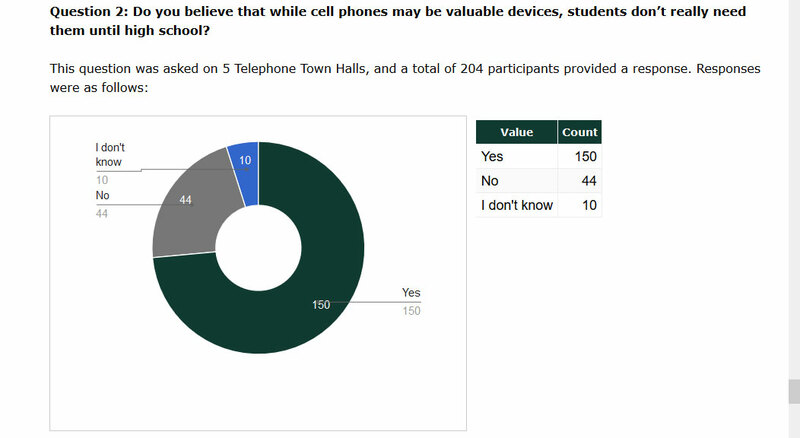 Just over 200 responses were received to a question about cellphone use pre-high school. Over 70,000 responses were received as the government consulted about possible cellphone use by more than two million students in the system. With such experience and input available on the subject, the government says it held the largest public consultation on education in the province’s history, including “more than 72,000 engagements across three different consultation channels” (open submission forms, online surveys and telephone town halls). Student enrollment in the province is roughly two million; nearly 180,000 teachers are members of the Ontario Teachers’ Federation. It turns out the increased capacity for cellphone use in the classroom supported by the government comes with an increased government ability to control cellphone use in the classroom, with little or no space left between a strict zero-tolerance policy and an anything goes permissive response. The new plan does add the open-ended and undefined phrase “except for educational purposes” to its call for a ban, opening up even more confusion about what its real intent is, and how it could possibly be enforced fairly and universally (if not logistically). 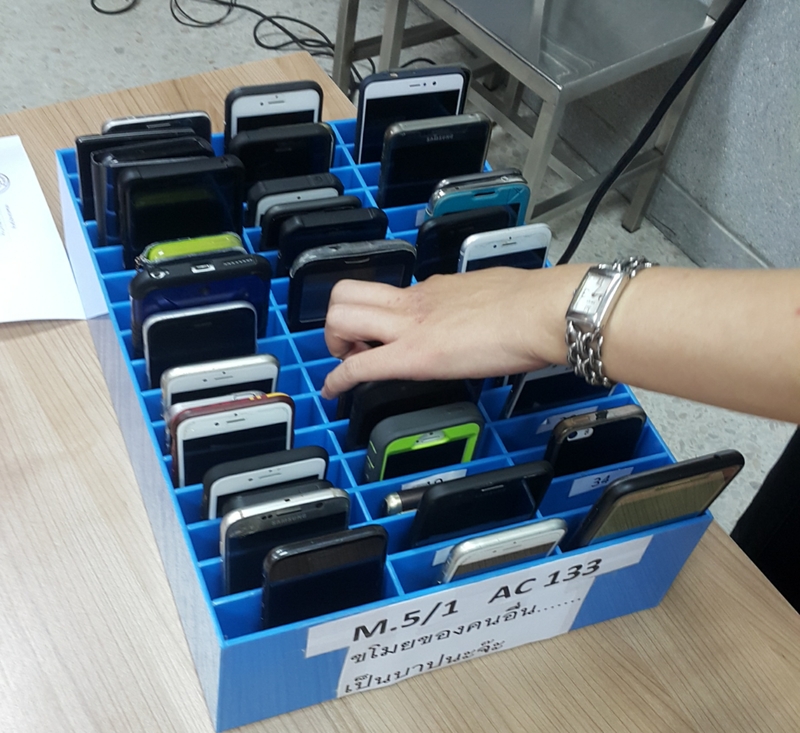 A mobile phone cage used for keeping the students’ phones away from them to stop their use in a high school classroom. Creative Commons CC BY-SA 4.0 image by Chainwit. Created 2017. The image of a cellphone cage outside every classroom is one of the ramifications of banning their use inside, and a terribly ironic reflection of the world around us. From the department of unintended consequences, jurisdictions with some experience trying to ban the cellphone from the classroom have reported an increase in cellphone theft and stolen smartphones, partly as a result of students needing somewhere to store their devices when they are in class. Naturally, companies have sprung up to offer device protection advice and sell services specifically to families with kids who want to avoid cellphone theft at school. So when the government says its cellphone ban is part of plans to “make sure our students are leaving school with the skills they need to build good lives”, one might also hope they can leave school with all their own property, as well. What’s Up with Drone Technology?